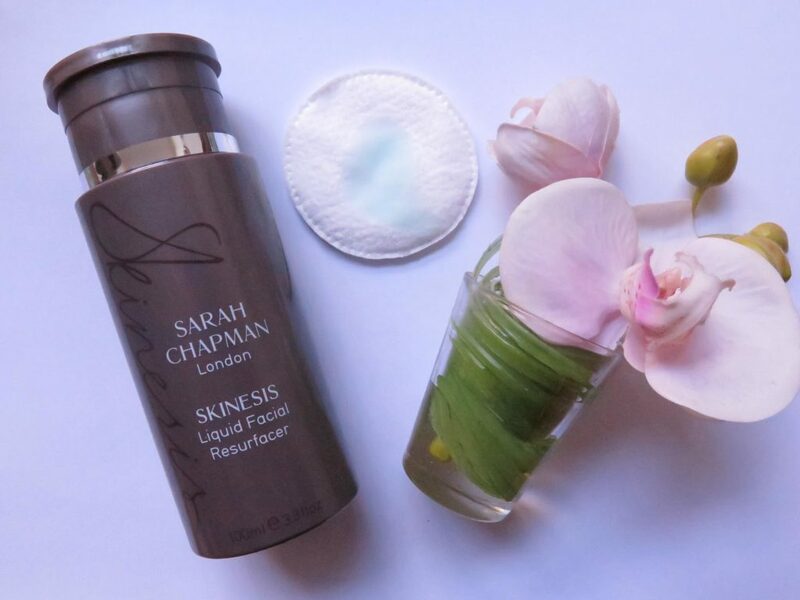 Sarah Chapman is a well-know facialist and a secret to many women’s glowing complexion, so you might want to keep an eye on her new product launches, if you already are not familiar with her skincare line Skinesis. Last December her latest addition, Skinesis Liquid Facial Resurfacer, has landed on my desk. Truth be told I was both curious and a little nervous, as I am tend to have peels applied to my skin only during a facial and not in the privacy of my own home. But first, let’s talk a little about resurfacing and peels in general. Did you know that by ‘removing’ the top layer of the skin, you can actually persuade your skin to rejuvenate itself? There are now multiple procedures you can try at a spa with qualified professionals ( don’t be tempted by ‘false’ economy and go to someone who isn’t professionally qualified to administer such treatments – consequences can be dire and costly !) or during a visit to a dermatologist, the most traditional forms being chemical peels and dermabrasion/microdermabrasion. Be warned: some peels might require you to stay at home while your skin ‘heals’ itself. Peels work by the chemical action of the acid and, unlike with dermabrasion or laser resurfacing, don’t have deep skin penetration ( provided they are used correctly (!). Sarah, who is often at the forefront of skincare innovations that you can use in the privacy of your own home, expertly blended a liquid infusion with pore refiners, vitamins, skin bio-surfacers and skin brightness that help recharge your skin and improve brightness and smoothness. Think of this product as a ‘Liquid facial’. By combining self-neutralising phytic acid, lactic acid and neurocosmetic-active Neurobiox this clever complexion corrector product micro-exfoliates and hydrates your skin, ensuring that you face will look more rejuvenated, your pores will be less visible (our pores often get larger as we age), lines & pigmentation less visible and skin tone more even, smoother and radiant. It also helps to regulate skin’s sebum production, while respecting skin’s acid mantle and ‘preps’ the skin for improved absorption of skincare products that you will apply to the skin after using the resurfacer. ‘Many of my clients say how much they love the results-driven peel and resurfacing treatments at my Skinesis Clinic and have been asking for something to give them similar ongoing skin improvements at home’. When one talks about a range of acids, derived from natural sources, a blanket term of alpha-hydroxy acid is used. Lactic Acid, for example, is normally derived from either sour milk or bilberries & is often used on sensitive skin, where glycol acid can be too strong. When working on this product, Sarah made sure that face-friendly acids have been carefully calibrated and combined with skin refiners, infusion of peptides, Cuivridone ( a copper derived active that helps to control sebum production) and a refreshingly uplifting blend of neroli and petitgrain. When you smell this light blue gel-like product, it might remind of fresh & crisp winter air or fresh laundry. I have used this product in the evenings, when testing it. After cleansing or double cleansing my skin ( depending on how much make-up I wore during the day ), I applied one pump of the blue gel to the cotton wool and swept it all over my face, making sure to omit eye and lip area. I have also extended it to my neck. Once my face felt ‘dry’, I followed it up with my usual serum, moisturiser or oil and went contentedly to bed. I have normal skin but sometimes my skin can rebel a little, which manifests in some redness. Considering the name of the product and late hours I tend to keep, I sort of expected an initial mild skin reaction but got none. – follow instructions to the letter and don’t experiment, this way the product will work effectively and lessen a chance of uneven pigmentation. – avoid ‘active’ sunshine if you can and use sun protection. Peels effectively dissolve dead skin but at the same time increase our skin’s sensitivity to sun rays. Sarah’s Skin Insurance SPF30 has become a faithful friend on those days when London actually ‘sees’ the sun. – don’t exfoliate on top of using this product.